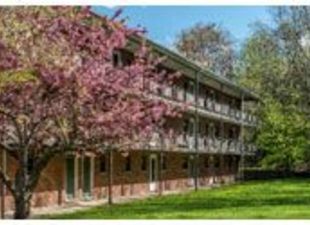 The Hamilton Company has acquired Woodland Park, a 126-unit apartment complex at 264-290 Grove St. in Newton, for $45 million, the company announced. The property abuts LaSalle College and Woodland Country Club, is walking distance to the Charles River and provides easy access to downtown Boston from the nearby Riverside Green Line Commuter Stop. The complex was purchased by Hamilton’s closely-held public entity, New England Realty Associates, from MJ Realty Trust, the original developer, for $45 million in a cash transaction. NERA was represented by Sally Michael, managing partner of Saul Ewing. The purchase of Woodland Park follows Hamilton’s recent purchase of a parcel in Union Square, Somerville for $5.4 million; the development of 150 Camden St. in Douglas Park in the heart of Northeastern University; and the continued redevelopment of the Packard’s Corner corridor in Allston. 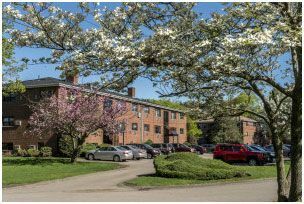 Set on seven acres, Woodland Park is comprised of 16 studio apartments, 30 one-bedroom apartments and 80 two-bedroom apartments. Rates will range from $1,260-$1,350 for the studios, $1,625-$1,750 for the one-bedrooms and $1,780-$1,950 for the two-bedrooms. Outdoor parking is available for 160 vehicles. Harold Brown, chairman of The Hamilton Company, which he founded 63 years ago, has also set his sights on a $100 million-plus redevelopment of Packard’s Corner in Allston, now in its second phase. This past fall, The Hamilton Company, which is headquartered a block from Packard’s Corner, completed a $25 million development of 48-units at 40 Malvern Street and will soon break ground on 140 units at 44-55 Brighton Ave. and 79-83 Gardner St. “We are bringing Boston to the New Allston,” said Brown. Since its founding in 1954, The Hamilton Company has amassed more than $1.9 billion in residential and commercial assets in the Greater Boston area. Brown, who frequently gives lectures on real estate trends and investments, is also founder of The Hamilton Company Charitable Foundation, of which Ronald Brown is chairman and Jameson Brown is a board member. The Foundation allocates millions of dollars annually to local non-profit neighborhood groups, charities and associations.